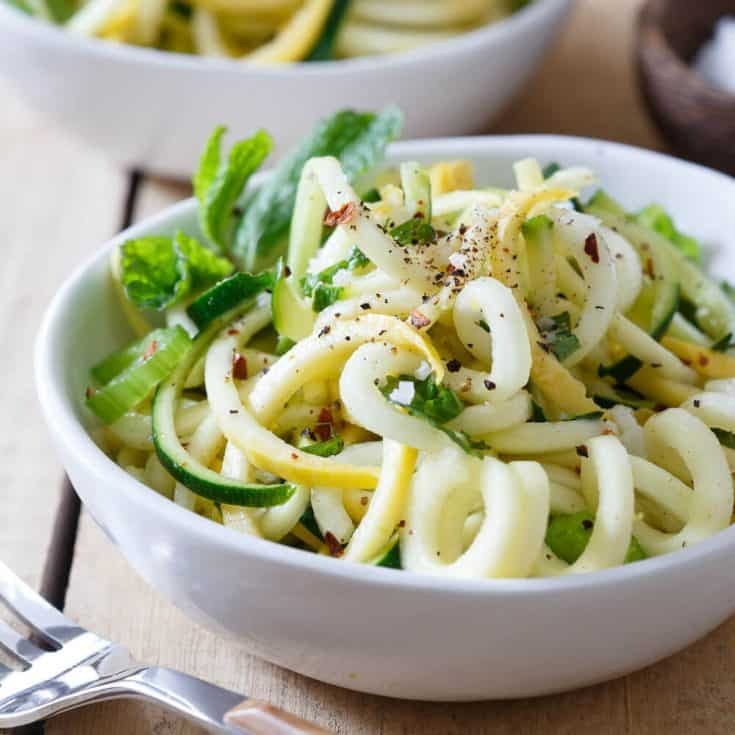 These simply dressed basil and mint squash noodles can be eaten as a refreshing side salad or a light meal that comes together in literally just minutes. I’ve long resisted the spiralized movement (and sworn by my much cheaper and handy dandy julienne peeler). Last thing I need or want is another counter top kitchen gadget taking up space in my kitchen. I have a weird obsession with clean counter tops – something that seldom happens because mail seems to ALWAYS accumulate at one end no matter how hard I try. And then there’s the issue of having to store the appliance in what I lovingly refer to as the junk cabinet – where all random kitchen gadgets live 95% of their life. 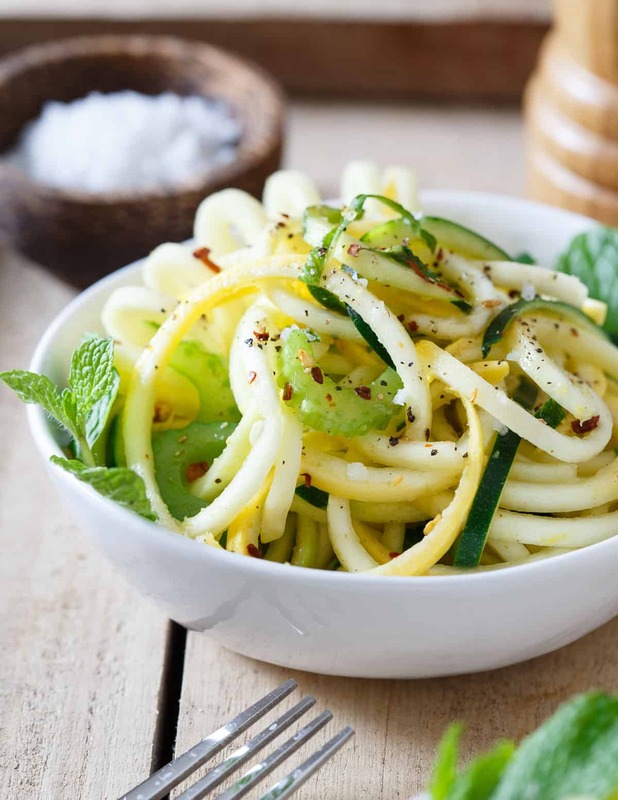 But then Brandy got the Kitchen Aid spiralizer attachment and brought it over for me to try out on these basil and mint squash noodles from Amie Valpone’s cook, Eating Clean and now here I am, contemplating another damn kitchen gadget. 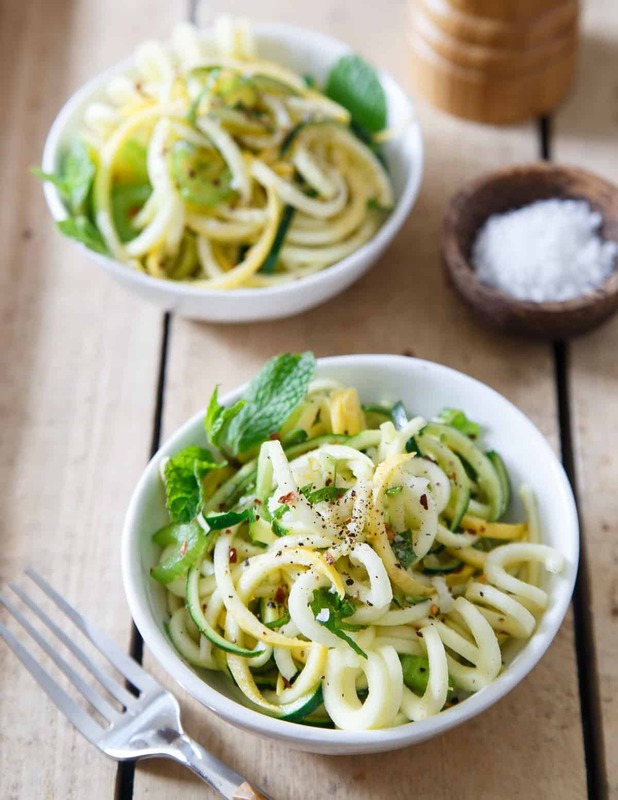 Because, you guys, look at how fun those zucchini noodles are! The curly yellow squash noodle at the bottom of the bowl above reminds me of the Burger King curly fries from back in the day as a kid when things like ingredient lists and fast food ethics occupied exactly zero space in my brain. 28 or so years later though, my brain is full of that stuff and spiralized zucchini noodles are the closest I’m getting to deep fried curly fries. 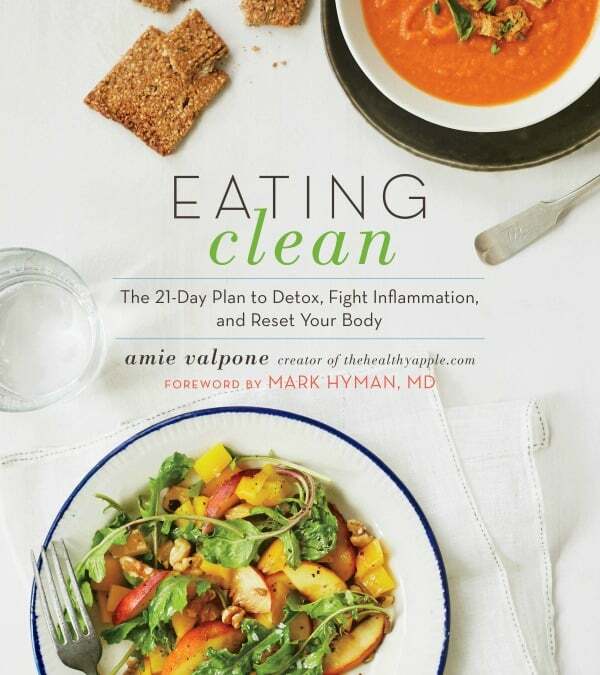 Amie’s book is filled with over 200 plant-based recipes free of gluten, dairy, soy, refined sugar, eggs, corn and processed ingredients. How she even came up with that many recipes blows my mind but after slowly making my way page by page through the book and looking at each one, I’m even more impressed because the quality of these recipes is on point. Real food, wholesome ingredients and a simple, clean outlook on health is what you’ll find. Her story (healing herself from a decade of chronic autoimmune disease through food) is remarkable and she’s used that experience to try and help others not only through this book but also her site, A Healthy Apple which has a ton of information for those who may be suffering like she was. This salad is so simple, (literally it takes just minutes to come together) you don’t even realize how much awesomeness is going on in it. From the basil and mint which can both help fight inflammation and bacterial growth to the fact that its grain free, low carb and low sugar, it’s is pretty much the definition of health in a bowl. Check out, Eating Clean on Amazon for yourself. It’s almost 50% off right now! 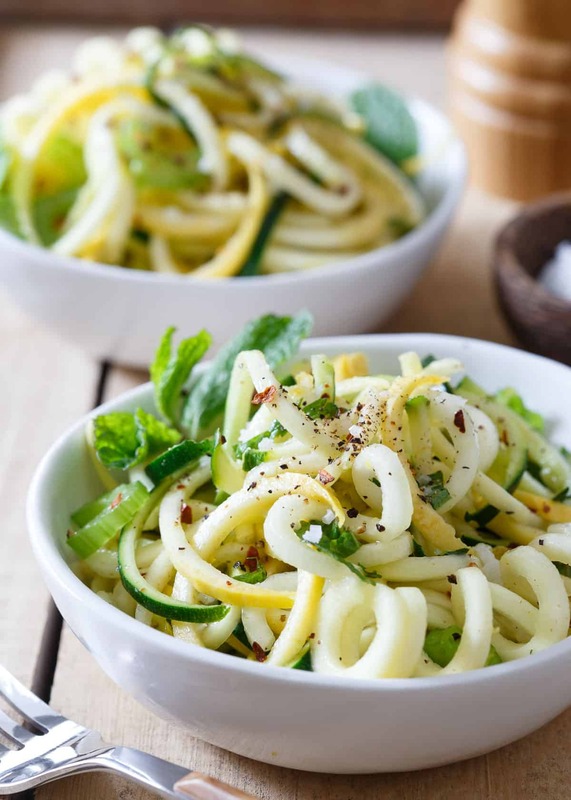 3 large yellow summer squash, cut into thin strands with a vegetable peeler or spiralizer or julienne peeler. In a large bowl, combine all the ingredients, toss to coat and serve. OMG I totally remember those BK fries. How could one forget? And are squash noodles called squoodles? Always wondered about that. Gorgeous squoodle bowl here and love your fresh and zesty mint dressing. Thank you SO much for this beautiful post, Gina. You are amazing and I am so grateful for your support. Thank you for taking the time to make this recipe and I hope you are loving my book. Sending you so much love and the biggest hug. Come play in NYC soon now that the weather is warming up. Thank you again! Grateful for you. I got a mini hand spiralizer that I have been wanting to use – but needing more creative recipes to use it for!! THIS is absolutely getting done! I love the mint! Nice and simple. Thank you and Happy Easter.